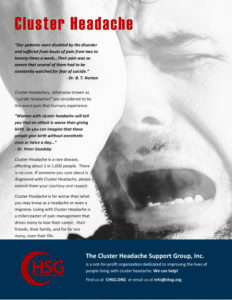 Cluster headache is a form of primary headache in which attacks are rapid in onset with very severe pain. The mainstays of acute therapy are inhaled oxygen and sumatriptan succinate injection. This study evaluates zolmitriptan nasal spray in the acute treatment of cluster headache.